Cooperation - Ramblings of Mad Shutterbug & the Border Collie Bros.
That would be today's connection to Flickr, rather than the subject of the photograph. Swallows on their nesting box, overlooking a salt marsh on the inland side of the dunes at Sandy Neck, Massachusetts. 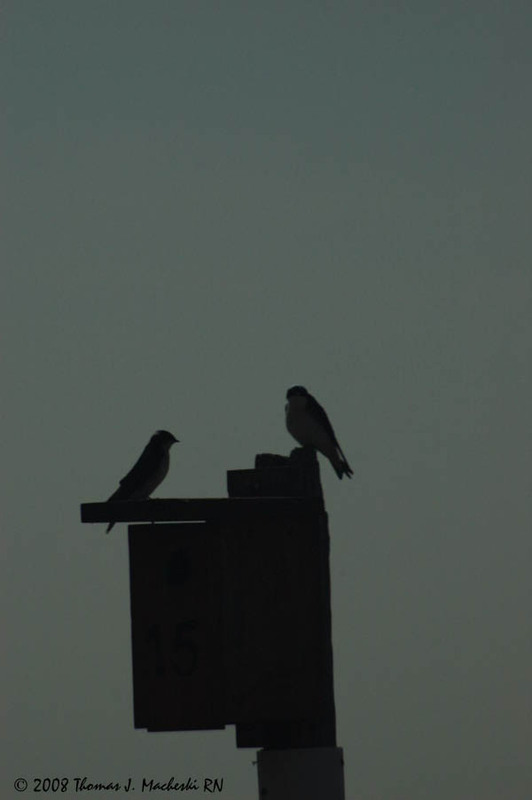 The nesting boxes are part of a study into territorial behavior of this particular species of swallow. I used one of my older telephotos for the shot, in manual mode and not recalling shutter speed or f-stop. Doesn't matter, I rather like the silhouette. Hospital, specifically the OR where I am once again practicing Nursing, shifted the start times forward by a half hour today. First Case in Room is still 08:00, but our clock-in time is now 07:00 rather than 07:30. A full team Shift Report is also re-instated. This might not seem like much for a lot of folks in Nursing, as most units do a full team Shift Report. Keep in mind, though, that most units are looking at maybe 20 people sitting in that report. There are 26 OR's in North Tower. That's an RN and a Surgical Tech (or in a good handful of rooms these days, two RN's) per room, plus a dozen or so PST (Patient Service Techs) and Anesthesia Techs each, so we're up to 76 people crammed into our Staff Lounge. Not quite so crowded/cozy in South Tower with only 12 OR's. Still, starting earlier also means finishing earlier. Today that provided time enough to swing across campus and deliver a CD of proofs to Doozer, then stop for Kitteh of Apocalypse kibbles on the way to Williston to pick up more Kid Milk Replacer. This got me home to teh Ranch a wee bit later than 'normal' for the old quitting time. whoo! full team shift report with 76 people, ouch!